The White House on Friday released a list of 28 prominent business leaders who will advise President Trump on manufacturing growth. Trump made job losses across industrial areas a focus of his campaign and pledged to bring back outsourced work. The announcement follows an initial meeting the president held with industry heads on Monday to discuss his plans and address business concerns. Dow Chemical CEO Andrew Liveris, who organized Monday's meeting, said that Trump is "not going to do anything to harm competitiveness," while Ford CEO Mark Fields added that he came away with "a lot of confidence." 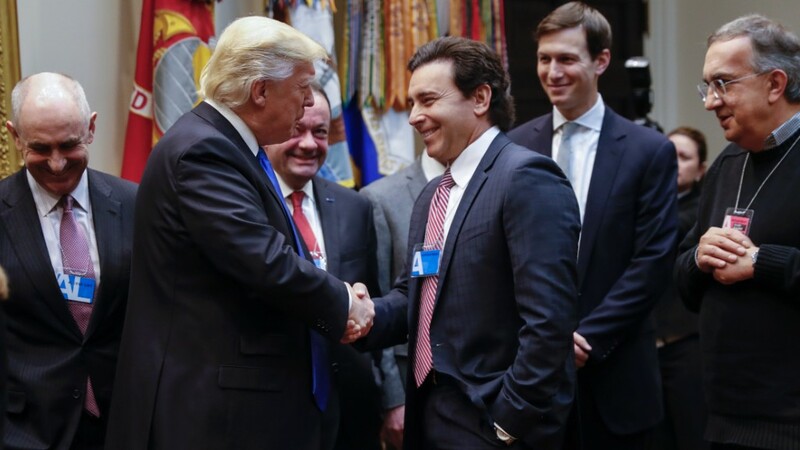 The manufacturing council includes Liveris, Fields, Dell's Michael Dell, General Electric's Jeff Immelt, Tesla's Elon Musk, Under Armour's Kevin Plank, U.S. Steel's Mario Longhi, and Boeing's Dennis Muilenburg. The White House's statement noted that the initial meeting was the first in a series of sessions the group planned to hold. Richard Trumka, the head of AFL-CIO, the nation's largest federation of unions, was also included on the White House list. Trumka, who called Trump "anti-American" and "racist" during the campaign, praised Trump on Monday after the president withdrew from the Trans-Pacific Parternship, an agreement the AFL-CIO and union groups strongly opposed. President Obama had a jobs council too -- but it stalled after only two years. In 2011, Obama created the President's Council on Jobs and Competitiveness led by Immelt, but the committee folded in 2013 after meeting infrequently. The council even became the object of ridicule during the 2012 election. "Guess how many meetings [Obama's] had with his jobs council?" Mitt Romney said in July 2012. "None. Zero. Zero, in the last six months."